This peak is named Storikeen nageer on on William Bald's map of Co. Mayo (1830). Previously in MV: Clashcame North-West. 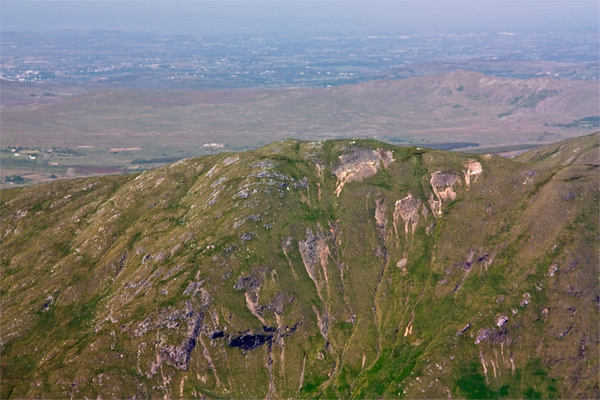 Barrclashcame North-West Top is the 336th highest place in Ireland. 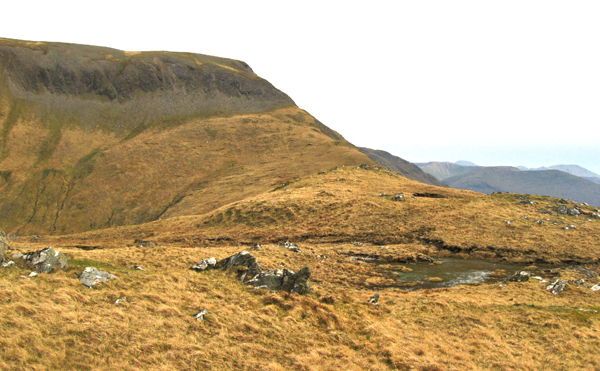 Barrclashcame North-West Top is the most westerly summit in the Sheeffry Hills area. Overshadowed summit with good views. This peak will always live in the shadow of it larger brother Barrclashcame. However it does provide a few extras such as the view of the north face of the Sheefrys and a good view into the huge NE coum of Mweelrea. I Barrclashcame, I saw, I conquered. Firstly, apologies for the excruciating pun in the title! This northern outlier of the Sheefrys is a surprisingly tough haul from the road in Doolough where there are several places to park roadside, for instance L8248069761 B. It took a sweaty hour and 15 minutes up the relentlessly steep NW spur and it really doesn't level off until 50m from the summit. From the summit there is a seldom-seen perspective of Croagh Patrick, behind Tangincartoor. 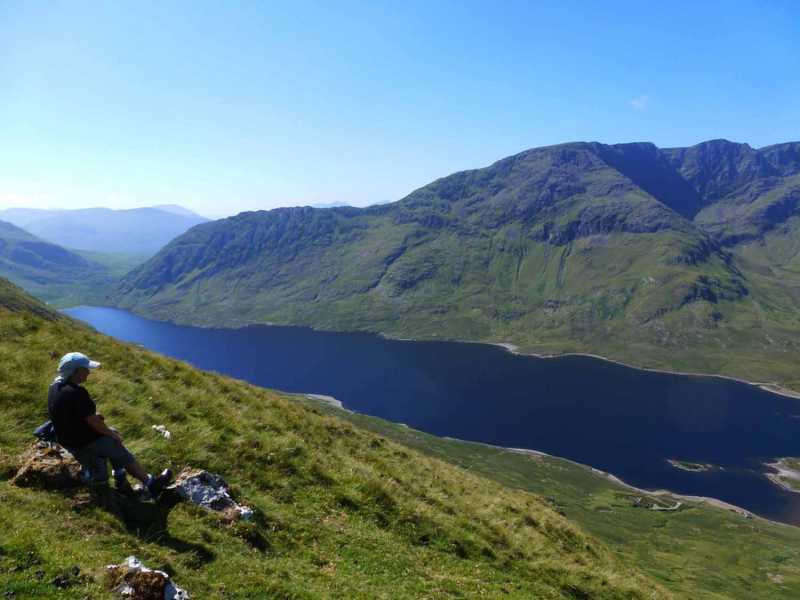 Picture from Colin Murphy : Doo Lough from near the summit. 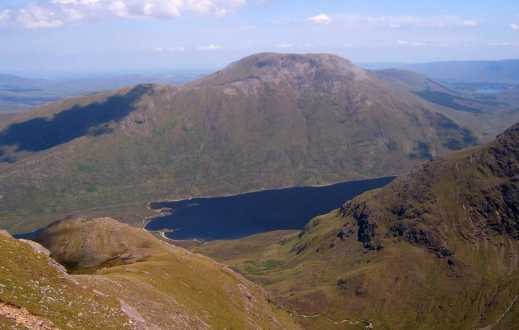 Picture: Doo Lough from near the summit. Parked at viewing point lay-by at L824 699 C, which is marked by a memorial to the Doolough Tragedy. We headed directly east for 1.5km and the ground starts to rise sharply almost immediately and is tough going - long grass hiding multiple holes etc. It eases somewhat after a couple of hundred metres and the terrain is more navigable, short grass and rocky underfoot. A few hundred metres before the summit it becomes steep once more, but is solid enough going. The top is quite well defined and marked by a small rocky outcrop. 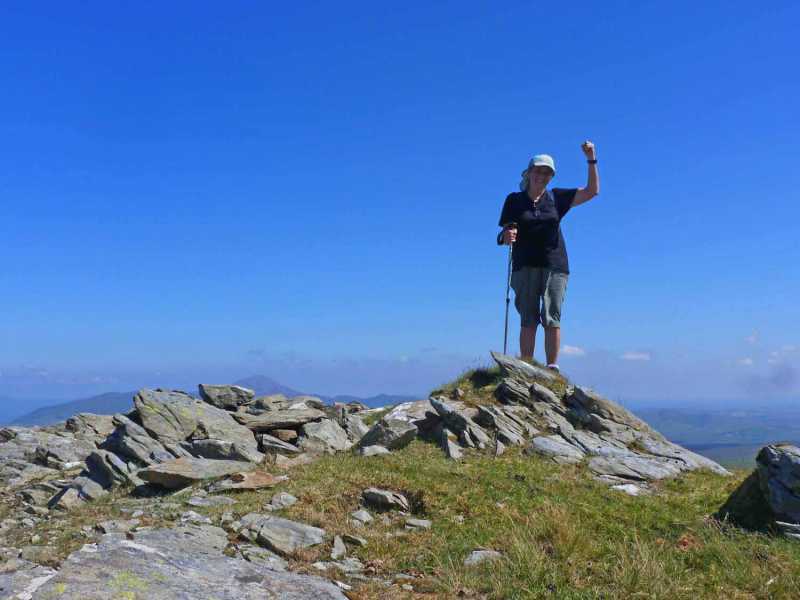 We climbed during the recent heatwave and it was like hillwalking in Spain (except a lot greener!). Deep blue skies to the horizon, the loughs below equally blue, and on such a day it is as magnificent as any scenery you'll find on the planet, with Doo Lough and Glencullin Lough sweeping the length of the valley below us, and from the summit Croagh Patrick rising through the haze to the north. It is interesting to note, geologically speaking, that the two loughs were evidently one at some point in the distant past, as can clearly be seen on a fine day, the material that now divides them having been swept down in a massive glacial slide from the Sruhauncullinmore Valley.